Your dog is one of the family, so why not bring them with you on your next UK holiday? They would likely enjoy joining you on your adventure rather than staying in a kennel and you won’t have to miss them while you’re away! At The Insurance Emporium, we want you and your dog to be able to enjoy as many magical adventures together as possible. That’s why we’ve put together this list of excellent staycation destinations to visit with your pooch. There are few things that dogs love more than going ‘walkies’, so what better place to take your pooch on holiday with you than the Lake District? 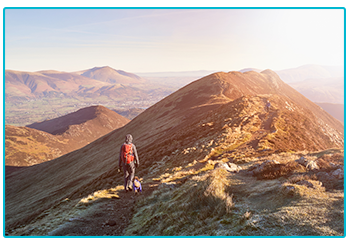 Together, you can ramble around picturesque lakesides or hike some of the many fells. Perhaps you could both conquer England’s highest mountain, Scafell Pike! There are plenty of dog-friendly cottages scattered throughout the Lakes, including these on Lakelovers. This Welsh county is home to the UK’s only coastal national park, which offers plenty of trails and coves for you and your furry friend to explore. Along the coastal path, many of the stiles have dog-gates for your pooch! If you want to let your pet play in the sand, you’ll be pleased to know that Pembrokeshire’s beaches all allow dogs. The area has plenty of accommodation options for you and your pup, such as these places with Coastal Cottages. 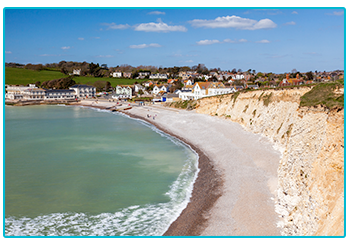 With plenty of beaches for your dog to run around on, the Isle of Wight could be an excellent place to get away to. The island also has a number of attractions that you and your pooch could explore, such as Carisbrooke Castle and Robin Hill Country Park. Wightlink offers free travel to pets, so you don’t need to worry about any extra expenses when it comes to catching the ferry! You can find a list of dog-friendly accommodation on the Visit Isle of Wight website. Thanks to its unusual geological formation, this intriguing area of coastline became a UNESCO site in 1986. Located in County Antrim, this 33-mile coastline from Portstewart to Ballycastle features plenty of beautiful areas to walk your dog. It’s also home to The Giant’s Causeway, which is famed for its interlocking basalt columns that make for stunning scenery. You can find plenty of dog-friendly accommodation in and around the towns along the Causeway Coast, with Causeway Coast Rentals among the sites listing a choice of these. This island on the West Coast of Scotland is famed for its breath taking landscapes. 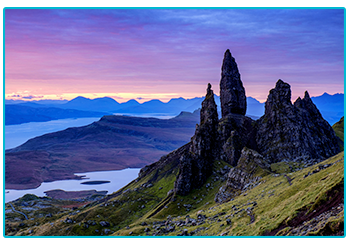 You can take your furry friend walking up The Old Man of Storr, alongside the Fairy Pools or around The Quiraing. When you don’t fancy walking, you and your dog can spend the day on the beautiful Coral Beach. There are various cottages dotted around the Isle of Skye where you could stay with your dog, with sites like Sykes Cottages listing a selection of them. If you’re hoping to go on a travelling adventure in the UK then having your pooch with you could make the experience more magical. However, should anything go wrong while you’re away, dog insurance could help deal with this. At The Insurance Emporium, our Gold policies could cover Accidental Damage for up to £800. * If this could help you relax while you’re on holiday then pop by The Insurance Emporium today! *Available on lunar monthly Time Limited, Maximum Benefit and Lifetime policies only. This blog is in no way sponsored, endorsed or administered by, or associated with Lakelovers, Coastal Cottages, English Heritage, Robin Hill Country Park, Wightlink Limited, Visit Isle of Wight Ltd., Causeway Coast Rentals or Sykes Cottages Ltd.